Kris grew up in the jewelry capital of the world, Rhode Island, USA, but her interest and exposure to jewelry didn’t peak until later in life. Her course of studies at the University of Rhode Island in Textile Science planted the seeds of appreciation for all things fashion. But her interest was slanted to the creation of fabrics – manufacturing the thread, weaving the cloth and assuring that the stitching held – rather than the end product: a beautiful dress, coat or suit. After graduation she worked in the Quality Assurance Department for a medical products manufacturer and gathered a strong manufacturing and quality assurance background. That training opened the door to her later work in the Quality Department at a division of Hallmark Cards, Trifari Jewelry, in East Providence, Rhode Island. During her decade long career at Trifari/Marvella, and eventually Crystal Brands, owner of Monet, Kris was tasked with working with the manufacturing personnel, suppliers, and some of the greatest designers in the world, to create a product that not only looked great, but would stand the test of time as a long lasting keepsake. She traveled world-wide sourcing parts, suppliers, and setting up offshore manufacturing processes. She established quality guidelines and inspection points to assure the art being shipped to the customer was the best it could be. Kris’ career allowed her to have the opportunity to participate in the creation of some pretty magnificent treasures as they evolved from a drawing to the exquisite, finely crafted jewelry seen today in many collections. Since Kris left Trifari/Crystal Brands she has expanded into product management for consumer products and even has a patent pending on an automotive product she and her husband collaborated on. Working at Trifari, Kris acquired some of the more unique pieces. Little did she know with her acquisitions, she would become a collector and those pieces would be the foundation for her collection. Her collection, with its strong Trifari and Monet foundation, has some very inventive and intricate designs, because when Kris looks at jewelry, she looks Beyond the Design. In 1956, Anthony (Tony) Angeli began his jewelry career in Rhode Island at the age of 17. Tony began working for one of the head designers, Helen Marian, assisting Helen in the Vendome jewelry line that was designated the Expensive Jewelry Line of Coro Inc. The Vendome jewelry sold to high-end retail stores such as Saks Fifth Avenue, Lord and Taylor, etc. Several years later, Tony attended the Rhode Island School Design for jewelry sample making and model making courses. His training and education with RISD led him further into the creative design field with Vendome. During his career at Vendome, he worked under the umbrella of the head designer, Helen Marian. Tony maintained a close relationship with until her passing. In 1966, Tony decided to leave Coro Vendome to venture into his own business, Hillcraft Inc. Through his business, he designed and manufactured costume jewelry that was sold to wholesalers including Tacoa Inc., Shalom International, Capri, Kramer, and Gaul. At the age of 39, buyers approached Tony to purchase Hillcraft Inc., and he accepted. However, after a year of “retirement,” Tony made the decision to open a second jewelry company, Tona, Inc. He also .became a partner in Tacoa Inc. until the jewelry industry began to change as the Retail Stores wanted to buy direct from the Manufacturer rather than the Wholesaler. Tony’s knowledge, creativity and commitment to the jewelry industry is truly extensive beginning with the actual design process through the manufacturing elements including model making, casting and plating. Tony has a private collection of unusual Vendome jewelry including prototypes that are available for sale at the Rhode Island Antique Mall in Pawtucket, R.I. Pieces from this rare collection will be available for purchase at the Costume Jewelry Collectors Int’l public jewelry show and sale being held Oct. 17, 2015, at the Radisson Hotel Providence Airport. Before the age of 18, Koral Michael Whalton was traveling independently throughout the United States. His journey into the field jewelry began in Tucson, Arizona, where he apprenticed with a silversmith. Under the silversmith’s guidance, he learned the “lost wax casting” method of silver work and learned to carve wax and fabricate metals into jewelry. Later, he became interested in costume jewelry. He was introduced into ‘white metal’ casting through a designer for the Pell Company in Long Island City, New York. Through the Pell Company, he was introduced to the Scannavino line of costume jewelry. Michael’s company, Halcyon Studios, purchased Adrian Scannavino’s life’s work and created a massive archive. The archives consist of antique-finished jewelry circa 1945, raw castings (Pennino, Pell, Marvella, and more), models, molds, tools, stones, and items spanning from the 1920s through the ’60s. During the early 2000s, Michael worked with late Donald S. Hobé of Hobé Jewels. He also created the wedding jewelry for the CBS film, The Rosa Parks Story: Ride to Freedom, which starred Angela Bassett as Rosa Parks and Cicely Tyson as her mother. Both actresses wore Michael’s designs in the film. Michael went on to create fine jewelry for Ms. Rosa Parks’ 89th birthday; Feb 4, 2002. The Detroit Institute of Arts displayed the original stage jewels under the direction of Mr. David Penny, the institute’s curator for Indigenous North American Art. Michael went on to create an 18 karat green gold and diamond jewel for the actor Danny De Vito in commemoration of the film, The Big Fish. In 2003, Michael created jewelry that appeared at the Grand Ole Opry in Nashville, Tennessee. for Hank Williams, Jr.’s tribute to Tee Tot Payne. Tee Tot Payne was Hank Williams, Sr.’s musical instructor when Hank was a child. Currently, Michael works with silver, gold, platinum, and white metal. His designs range from Indigenous North American to antique art jewels, to organic matter preserved to look like leather. So far, his journey has been exciting, rewarding, and anything but boring. On Saturday, Michael will be selling the last remaining pieces of finished jewelry from the incredible Scannavino archive. A once-in-lifetime opportunity to purchase a piece of history! Back by popular demand, renowned South African jewellery designer Kevin Friedman has captivated both the local and international jewelry trade with his one-of-a-kind pieces which use an innovative combination of high cartage gemstones and precious metals with ordinary everyday “found objects”. Kevin is a renaissance man who draws on the world around him for inspiration and creativity. His highly original, fresh approach to contemporary jewellery design, such as the extraordinary $16 million Ponahalo Necklace created for the Geneva-based Steinmetz group, is attracting major international interest. This extraordinary necklace – composed of a 316,15 carat diamond which was cut into five stones, combined with beads and 276 safety pins and made into a Marie Antoinette-style necklace – debuted at the Cannes Film Festival in 2007. The necklace and other examples of Kevin’s cutting-edge designs featured in luxury US magazine LuxLife in 2008.The Robb Report also devoted a page to this piece, saying that the necklace was “the most exciting piece of jewellery ever created”. A lifelong fascination with the distinctive arts and crafts of South Africa has proved a valuable inspiration for his work, and he has been involved in meaningful community development projects with local crafters. Proof of this is his well known Ndebele bead and diamond choker, modeled by Charlize Theron, which garnered Kevin a De Beers Diamond International Award in 2000. Kevin’s custom-made pieces have featured in the “ultimate catalog” Neiman Marcus Christmas Book, as well as in Gumps Magazine and Woman’s Day Magazine. He also created a line of beadwork Christmas decorations for the Designers’ Guild in London. In addition, he has designed a line of pewter and wood desktop items for Tiffany & Co in New York. On the home front Kevin’s beadwork, in particular his iconic Ndebele tree topper Christmas angel, for which he won an award from the South African government, is now appearing in the eighth definitive issue of SA Stamps. “My angel will be flying all over the world,” he quips. Kevin has been director of design at Frankli Wild™ African Classics in Johannesburg since 1989 and has built up a blue-chip clientele. He is part of a seven-generation line of jewelers. His grandfather Jack Friedman, who was born in Riga, Latvia, set up a jewellery manufacturing factory in Johannesburg in 1934. Jack was a founding member of the South African Jewellery Council and both he and Kevin’s father Frank were extremely influential in the South African jewellery industry. Frank won many international awards set up by the Gold Council and the then Chamber of Mines. Kevin says that his father was particularly encouraging during the course of his career, allowing him to experiment and to push the envelope, while teaching him that education is the starting point of strength. Melinda L. Lewis is the author of The Napier Co.: Defining 20th Century American Costume Jewelry, Life By Design Publishing, 2013. 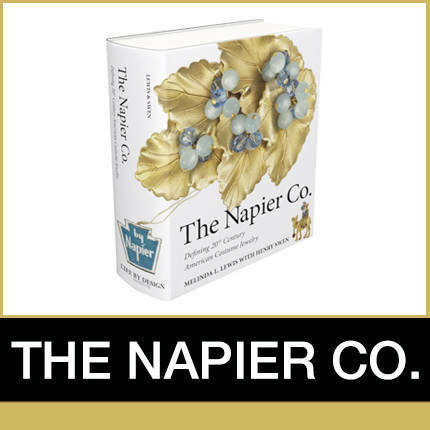 As a jewelry historian, she has been involved with the online vintage costume jewelry community for the last 14 years, with a focus on The Napier Co. over the past 11 years. She writes a monthly column for Your True Colours magazine on the topic of vintage jewelry. Lewis is a grandmother, and mother of two grown girls, and resides with her husband in California. Other interests involve studying fashion and vintage magazines, advances in the treatment for fibromyalgia and chronic migraines, and brain biochemistry. Sponsored by the Providence Women’s Jewelry Association, jewelry veteran Barbara Raleigh, whose knowledge and experience ranges from the big picture to the smallest detail will be presenting at this year’s 2015 Costume Jewelry Collectors International Conference. Barbara has served the jewelry industry from 1978 to date. From her art background, she began her career designing and producing one-of-a-kind enamel and karat gold works shown in numerous galleries in New York City. Her career in the costume jewelry industry began at Trifari, one of the oldest and most famous brands in the history of costume jewelry, where she was Vice President of Design. There she managed every aspect of the business from design, creation and development to manufacturing, sourcing, product development, marketing, merchandising and sales. Then at Etienne Aigner, she pioneered their jewelry lines and collections helping to build a $14 million company. She has also helped grow the businesses of other international and domestic companies from small start-ups to bigger established firms. She has traveled the globe working with manufacturers and designers from the Philippines, China, Japan, Italy, and England among other countries. Barbara has spoken at jewelry trade shows and organizations on trends and directions, taught at Fashion Institute of Technology as an adjunct professor, and even had her own television show in the United States and the United Kingdom on QVC, where she worked as a consultant and creative director to the jewelry department. Barbara’s current venture, International Design Source based in New York City, was founded in 2010. Barbara’s serves her clients by utilizing her expertise in all aspects of the business, from concept and development to sourcing, manufacturing, merchandising, and sales. Her business travels to the fashion meccas of the world to research and report on upcoming trends and directions. Her trend forecasts published twice a year, Spring/Summer and Fall/Winter, offer her customers information about current fashion movements, demonstrate why these forecasts are important, and illustrate how they are interpreted in other industries and by the competition.